Safia grew up in Peshawar, the north western border city of Pakistan. She trained as a teacher and had a post-graduate degree in linguistics from the University of Edinburgh, Scotland. In1987 she started her career as a journalist of the BBC and moved to Great Britain. As a journalist she traveled to India, Iran, China and Afghanistan and frequently visited Pakistan where most of her family members live. In 2004, as the Director of a Project for the BBC World Service Trust, she lived in Afghanistan and worked in some of the remote parts of the country. She is an established writer of Pashto, her first language, and several of her novels and short story books have been published in the region. 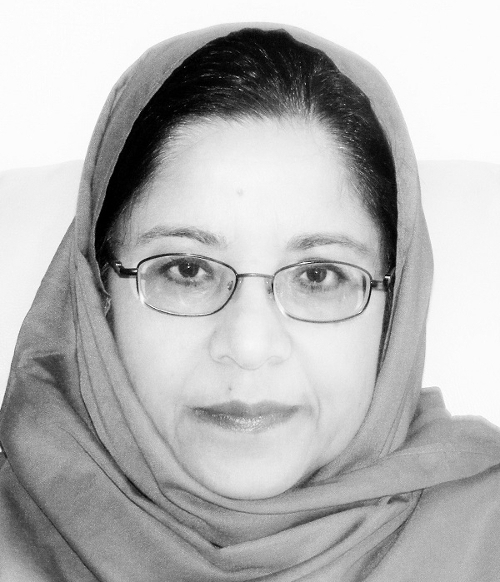 In the past Safia worked on a freelance basis developing educational material for Afghanistan, and advises a group of Afghan volunteer doctors based in Europe. A full time Pashto writer, she has authored over 20 books, half of them on the history of the Pashtoon people. Safia is also the patron of a charity in Peshawar that works to promote education and vocational training for women to become economically empowered. Safia Haleem has her own Website in Pashto and in English. Weddings provide a great opportunity for entertainment in Pakistan. There is music, dance and sumptuous food, all to be experienced in one evening. Try to get invited to a wedding and you will certainly enjoy the atmosphere. It is also a chance to see people from various social backgrounds, and to make contacts. Most wedding parties have an open fire kitchen set near the venue, so it is a great opportunity to experience authentic food prepared by local chefs. Women usually design and prepare their dresses months in advance which turns the party in to a fashion parade as well.